Angler Lauren Dunn caught and released this impressive cutthroat trout (Oncorhynchus clarki) that weighed in at 4.5 kilograms (10 pounds) and qualifies her for the potential new women’s 2 kg (4 lb) line class world record. 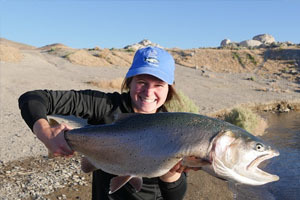 Dunn was fishing the renowned Pyramid Lake, Nevada, and needed approximately 15 minutes to land the fish after hit the jig she was casting. The current world record in this category is vacant. A potential new world record dolphinfish (Coryphaena hippurus) weighing 33.05 kilograms (72 pounds, 14 ounces) was caught on July 3, 2018 by angler Lucas Duke while fishing with Wasabi Sportfishing out of Hatteras, North Carolina. 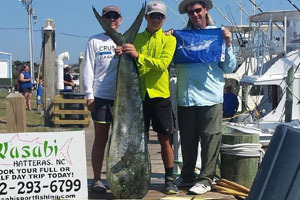 If approved, the catch would qualify Duke – age 14 - for the Male Junior world record and potentially a line class world record depending on the tackle used. 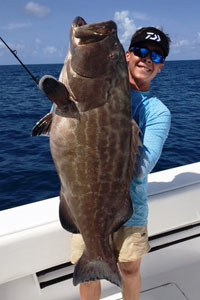 Junior angler Daniel Delph potentially set the new Male Junior world record for black grouper (Mycteroperca bonaci) with this quality 24.5-kilogram (54-pound) fish that he caught on June 28, 2018 while fishing off Key West, Florida. If approved, the catch will replace the current Male Junior world record of 15.76 kilograms (34 pounds, 12 ounces). Japanese angler Yukiyo Okuyama caught and released this beautiful 4.19-kilogram (9-pound 3-ounce) rainbow trout (Oncorhynchus mykiss) on June 29, 2018 while fly fishing the Katsura River, Japan. 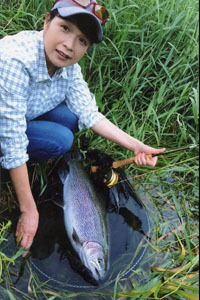 Okuyama played the fish for approximately 20 minutes on light tippet before it was landed, documented, and then released alive. If approved, the catch will become the new women’s 2 kg (4 lb) tippet class world record, which currently stands at is 3.37 kilograms (7 pounds, 7 ounces).